The content of the Bible has been nearly constant since the fourth century, when St. Jerome prepared the Latin translation known as the Latin Vulgate Bible. But the size and format changed several times. In the 11th to 14th centuries, Bibles went from giant-sized to pocket-sized, commentary from early church fathers was written alongside the scripture, and the books were divided into chapters. A variety of books were used for the Mass or for the Divine Office (the eight prayer services chanted each day in the religious communities.) The collection includes leaves from psalters, missals, breviaries, antiphonaries, graduals, and a gospel lectionary. The treatises written by the great philosophers and the early church fathers were rescued and propagated during the Middle Ages. We have leaves from commentaries by Boethius on Aristotle's Categories, by St. Thomas Aquinas on Peter the Lombard's Sentences, and on Lucan's Pharsalia. Writings about both civil and canon law found their way into many libraries. In the 14th century, a new prayer book became popular among royalty and the nobility: the Book of Hours. It consisted of a calendar of feast days, a short reading from each Gospel, and a variety of prayers and recitations. The most lavish Books of Hours were decorated with miniature paintings (“illuminations”) and elaborately painted initials and borders. 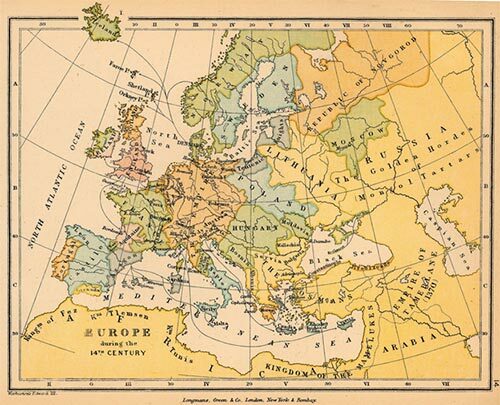 Europe in 1135. Colbeck, Charles., ed. "Public Schools Historical Atlas". Longmans, Green, and Co. New York, London and Bombay. 1905. However, for this database, we have assigned Country of Origin to the countries that exist today, except that we list Flanders (Belgium + The Netherlands) as a separate country: England, France, Germany, Austria, Switzerland, Flanders, Spain, Italy. Most of the books that survive from the Middle Ages were produced in the 14th and 15th centuries. Not as many survive from the 13th century and only a few from earlier centuries. We should note that very few single leaves can be dated with absolute certainty. In preparing this database, we have used a combination of information received from the donor and codicological and paleographic clues to assign an approximate date. Handwriting evolved during the time period represented by our collection. 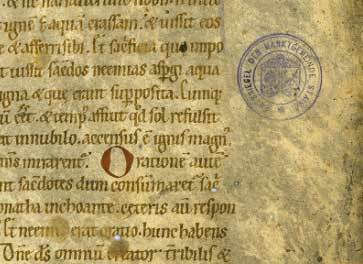 Most Continental manuscripts from the 9th through the 11th century were written in Carolingian script. Writing style began to change in the 12th century and reached its full Gothic splendor by the next century. During the same period, less formal styles that could be written more rapidly emerged for documentary use. In the 15th century, scribes and artists in Italy began developing the Humanistic style, which echoed the writing styles, page layouts, and decoration of earlier centuries. A transitional script between Caroline Miniscule and Gothic. The letterforms became more oval and compressed laterally. The letterforms became very angular, drawn with a succession of straight strokes rather than curves, and compressed. The minims (vertical strokes of m, n, I, u) had distinct feet. A Gothic script with a few cursive letterforms: Single-compartment a, f and s stab below the line, but no loops on ascenders. Used often for books in the vernacular language, or for administrative documents. Single-compartment a, loops on ascenders (b, d, h), f and straight s stab below the line. The highest grade of Gothic cursive script, used for many Books of Hours. The writing had a definite slant to the right. A script developed in Italy in the late 14th century, which returned to letterforms and layout characteristics from the Carolingian age. Bible leaf with gloss, 13th c.
The decoration provides some of the best clues to where, when, and for whom a manuscript was produced. The style and colors used for the large initials, borders, and illustrations evolved over time and developed differently in different places. In the Gothic liturgical books, a hierarchy of initials called out the importance of each part of the page and rubrics gave special instructions. As book ownership spread from the church to the nobility, decorative borders and miniature paintings were added to the text. Scribes and artists sometimes drew humorous drolleries in the margin, or added mythical creatures to the border designs. The aristocrats who commissioned pieces often asked to be identified in the illustrations by a coat-of-arms or as one of the bit players in a scene. All of these decorative elements add to the richness of the pages, and manuscripts were, and are, highly prized because of them. Our collection includes a variety of initial styles: Romanesque, foliated, pen-flourished, littera duplex (also called puzzle initials), white vine, plain, and Cadel. There are several lovely borders, including a few inhabited with dragons and one with a woman in medieval headdress. A few leaves in the collection are decorated with amusing drolleries. Condition: Evidence of damage (water, insect, glue, trimming), repairs, and general condition is listed in the Notes field. Previous Use: Quite a few of our leaves were used as bindings or pastedowns for other, later manuscripts. Provenance: We have very little information on provenance of the fragments in the collection, even those that came from a known donor. One exception is two bifolia of a manuscript marked with a municipal stamp, which helped us identify the region in Austria where it was produced.